I was fortunate enough this Summer to enjoy two very impressive – yet different – cinematic experiences. One, a premium home theatre installation; the other, an IMAX Laser screening. Which was better? Well, it's complicated. First came a demonstration of a domestic Dolby Atmos setup, using Steinway Lyngdorf speakers, Lyngdorf processing, and a Sony 4K projector. This was actually one of four systems I sampled at Steinway Lyngdorf's UK distributor Gecko Home Cinema during an afternoon. I was made to feel like a VIP, but considering the price of some of the Steinway Lyngdorf catalogue, that's not a surprise. This particular array, using the brand's Model S speakers and boundary subwoofers, sounded superb, and the visuals were exquisite. The opening Zero attack sequence from Unbroken was a smorgasbord of crisp fidelity, unwavering tonality and hemispherical immersion – completed by nuanced yet deep, deep bass. Around 24 hours later I was in Sheffield to view Solo: A Star Wars Story in the IMAX Laser screen at Cineworld – one of only two such screens in the UK (the other being in London's Leicester Square). As an experience, this was, outwardly, the polar opposite. This theatre has hundreds of seats and a screen the size of a small country – it dwarfed the cinema room I'd been in the day before. Yet both setups offer the same thing. Watching a movie. The IMAX Laser projection was remarkably clean and sharp (when Solo... made the effort, that is – it's a murky movie in places. Shark B-movie The Meg, viewed at the same cinema a month or so later, looked astonishing) and the sound system unearthed astonishing levels of scale, dimensionality and impact across the frequency range. I was in cinematic heaven. The ticket price was £17, but I honestly don't mind paying that sort of premium if the alternative is saving a fiver and cramming into an unloved, unimpressive auditorium carved out of a multiplex. I'm more annoyed about the cost of a bag of M&Ms. But here's the thing. While IMAX's bespoke dual-laser projector system yields visuals that no home cinema can really counter (the size of the screen, naturally, has something to do with it), did the full-size, multichannel audio performance outgun that of the Steinway Lyngdorf array? Not in all departments. At times it sounded impossibly huge, and – where other vanilla commercial cinemas can sound as if they're missing out on surround info – wonderfully immersive, but the Steinway Lyngdorf system edged it in terms of clarity, timing and imaging. The reason no doubt comes down to EQ and calibration. IMAX's speaker system, running to 12 channels, attempts to create an audio sweet spot that covers multiple, multiple positions. In the Steinway Lyngdorf demo, I was sitting in the prime listening position, hearing a speaker/processor combo that had been set up to target that exact seat with pin-point precision. 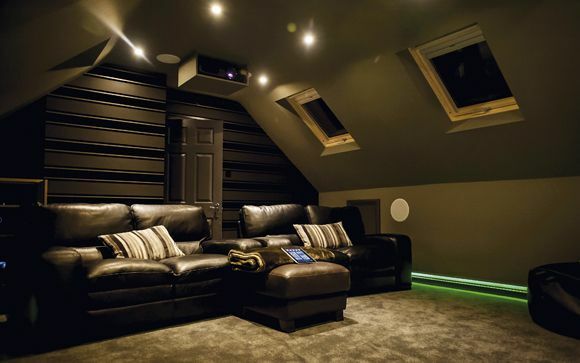 This is surely part of what makes home cinema so fabulous. It's a personal experience that can be tailored to just you. If, for some reason, you want to listen with your subwoofer so loud that it drowns out everything else, you can. If you fancy viewing with your TV in Dynamic mode, you can. And, most obviously, you can pause/rewind/skip a movie to your heart's content. No commercial cinema manager, no matter how politely you ask, is going to halt a presentation just so you can nip to the toilet.